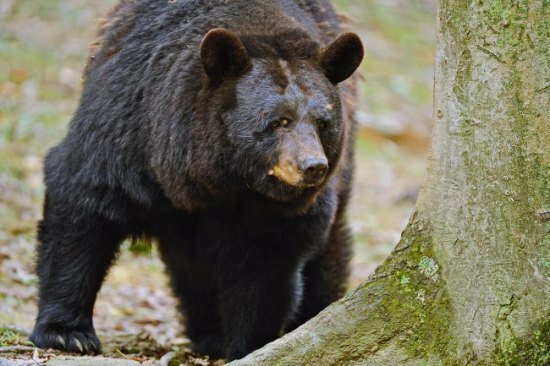 SOUTH CHARLESTON, W.Va. – Hunters are reminded that a concurrent bear season without dogs will occur Nov. 21 – Dec. 3 on public and private land in 17 counties, according to Colin Carpenter, black bear project leader for the West Virginia Division of Natural Resources. Barbour, Braxton, Calhoun, Clay, Gilmer, Grant, Greenbrier, Hardy, Harrison, Lincoln, Pendleton, Pocahontas, Randolph, Tucker, Upshur, Webster and Wirt counties will be open for concurrent bear hunting during the traditional buck-gun season by permit only. Resident landowners, their resident children or resident tenants who live on the land are not required to apply for a limited bear firearms season permit or purchase a class DS bear hunting stamp to hunt on their own land. Hunters must apply for a limited bear firearms permit using the Electronic Licensing System at www.wvhunt.com. To apply, log in and select “Enter Lottery.” Choose “2016 Black Bear Hunt” and select the county where you want to hunt. Hunters also may call their local DNR district office for help with the application process. The deadline for applications is Aug. 15, 2016. Successful applicants will be notified by mail by the first week of October. Successful applicants can see whether they received a permit starting Aug. 22, 2016, on their online account. Neither the permit nor the class DS stamp is transferrable, and the county of hunt cannot be changed. Hunters also are reminded that there are 16 counties in West Virginia where prior application is not required to hunt black bears during the buck-gun season. Details concerning bear hunting seasons can be found on pages 35-39 of the 2016-2017 Hunting and Trapping Regulations Summary brochure online at www.wvdnr.gov or available soon at all license agents.